Do you have a lonely parent who is struggling with feelings of isolation or depression? Are you having a hard time getting them to leave the house and enjoy social activities, especially during this festive season? With age comes an increased risk of loneliness and social isolation. And it can be even more prevalent in seniors who either cannot or do not want to leave their home. 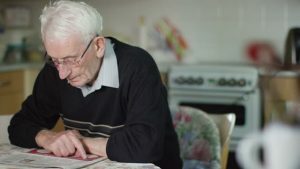 This can be problematic for seniors because loneliness can often result in depression and ultimately additional health problems. They are no longer able to drive, and they must rely on others to take them where they need or want to go. Some are reluctant to ask for help with transportation, so they don’t get out and socialize with others. This can also be harmful if their pride is causing them to also miss health check-ups and follow-up appointments. They have physical limitations, such as chronic pain or mobility issues, and thus have difficulty getting around. They have poor vision or hearing and simply don’t feel comfortable being in noisy places with a lot of people. They may be battling depression or anxiety and are unable to leave their home. If your parent is on a fixed income, they may be worried about the potential cost of social activities and prefer not to spend any extra money. Feeling alone and sad much of the time does not need to be a normal part of the aging process. There are ways you can help your lonely parent feel more connected to friends, family and their community, and possibly combat depression and loneliness. Just visit…virtually if you must. Even more so today, there are widening geographic distances between seniors and their families. And if you live far away, you might not realize that your loved one has become isolated. They may feel embarrassed or too proud to admit they’re lonely. If you don’t live close to Mom or Dad, you can still visit with them either on the phone or through text, Facetime or Skype. Social media also is a great way to stay up-to-date on family happenings, and it’s an easy way to share photos. Be aware. Pay close attention to times that may prompt loneliness, such as the holidays or anniversaries of births and deaths. Stay connected and keep in touch more often during those difficult times. Keep them active. Encourage parents to get involved in activities outside of the home if they are able, such as a participating in a hobby they enjoy, a senior exercise class (SilverSneakers is a great place to start), adult education classes or a volunteer opportunity. Staying active also can mean regular visits with friends to have lunch, take a walk or just talk. A local senior center may be a great place to start as most offer regular group activities, organized games and social get-togethers. Ask for nearby support. Talk to neighbors and let them know about your parent’s living situation. Ask neighbors to check in with your parent from time to time. Put together a phone list of those nearby, and provide them with your contact information in the case of an emergency. Consider companion care. FirstLight Home Care offers senior companion care services that include regular visits, conversation and company, medication reminders, meal preparation, shopping, transportation and more. This can provide much-needed peace of mind for families who do not live close to their elderly loved one. If you’re interested in learning more about our senior companion care services, contact the FirstLight office nearest you. If you have a specific question about caregiving or are concerned about the specific needs of your aging loved one, you can Ask Our Nurse for expert advice and help in navigating the challenges that often come with family caregiving.